Succulent evergreen perennial plant from southern Africa. Bluish-green, toothed leaves with tapering and curved tips, arranged in rosettes at the end of branches. 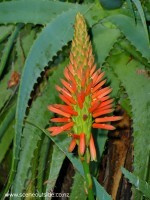 Very striking, bright orange to red, nectar-producing, tubular flowers in racemes on long stems during winter. The specific epithet 'arborescens' means tree-like. The word krantz in the common name refers to 'rocky cliff' in Afrikaans. Prefers a sunny position in well-draining soil. Suitable for coastal areas. New Zealand native, clump-forming perennial with drooping, strap-like leaves and white flowers in late spring to early summer. Dull-green leaves, 40-70 cm long and 3-10 cm wide, arranged in basal rosettes. Star-shaped white to cream flowers, 2 cm across, produced in long-stalked panicles. Flower stamens are white and purple with curled yellow tips. Occurs naturally in New Zealand throughout the North Island and northern parts of the South Island. It can be found in a range of different habitats from coastal regions to forests and exposed, rocky, inland areas. Several cultivars have been developed, differing from the species in size and width of the leaves. Rengarenga was used by Maori for nutritional, medicinal, spiritual and cultural purposes. Prefers free-draining soil in full sun or shade. Tolerates dry conditions. Suitable for very exposed sites, but has a smaller, tighter habit in such conditions. Leaves are damaged by light to moderate frosts, but even when all the leaves have turned into a brown mush due to frost burn, there is a good chance that the plant will recover in spring. To maintain a healthy, tidy appearance, pull out spent flower stalks, remove old or damaged leaves, and protect from snails and slugs. Fertilise or add compost if the plant seems to sulk and the foliage turns yellowish. Easy to propagate by division. Arthropodium cirratum looks great when planted en masse as a ground cover under trees. Very attractive when in flower. Particularly effective when used as a foliage plant, adding a structural dimension to mixed plantings. Also suitable for containers. Large clump-forming plant with silvery, flax-like foliage, native to New Zealand. The leaves are broad and stiff, but droop towards the ends. Flowers are produced in spring and are followed by orange fruits. They are generally obscured and dominated by the foliage. Suitable for sun or shade. Requires well-draining soil. Drought tolerant. Although Astelia chathamica 'Silver Spear' tolerates quite windy conditions, the leaves hold their shape better when conditions are not too exposed. Astelia chathamica 'Silver Spear' is intolerant of high moisture. Hardy to about -7oC. Striking feature plant. The silvery foliage looks particularly good in sheltered, shady or partially shaded conditions. Careful when combining Astelia chathamica 'Silver Spear' with other grey-leafed plants; this tends to become quite overpowering. Instead, you could consider a combination with fine-leafed grasses or blue-flowering plants such as Dichroa and Geranium. An attractive, but strong contrast can be achieved with Loropetalum chinense 'Burgundy'. Suitable for containers. Evergreen fine-textured shrub or tree with small green leaves and inconspicuous greenish cream flowers. Glossy green, simple, ovate to oblong leaves, 1.5-2.5 cm long, arranged in opposite pairs along the stems. Foliage emits a distinctive scent that is not to everyone's liking. Fresh green spring leaves, turning mid to dark green later in the year. Clusters of tiny flowers without petals during late spring. Usually grown and maintained as a shrub, but can eventually reach tree-like proportions up to about 9 m tall. Grows in a wide range of conditions, except waterlogged soil. Once established, Buxus sempervirens tolerates drought. In suitable growing conditions, a growth rate of 10-15 cm can be expected. In deep shade, very exposed situations, or very poor soils, growth is much slower. Most cultivars have a slower growth rate than the species. Responds well to trimming, and can be maintained to a height of 50 cm or less for many years. Trimming during late summer gives the plant a chance to produce sufficient new growth from early spring, and prevents sunburn of young leaves formed after the trim. After a number of years cut out some of the mature stems below the pruning height for the rest of the plant to improve ventilation through the foliage and avoid overcrowding at the top. Widely used as a formal hedging plant with about 4 to 6 plants per meter for low hedges. Suitable for topiary projects. Since it can be trimmed to any shape, Buxus sempervirens is a very useful shrub to add a structural element to garden beds. Can also be grown in containers. Eurasian, herbaceous perennial in the Asteraceae family. Grey-green, deeply cut, evergreen foliage. Spherical, steel-blue flower heads, 5 cm across, on long, silvery stems in late summer and autumn. Attracts bees and butterflies. Birds like the seeds. Prefers a sheltered position in full sun and poor, well-draining soil. Tolerates partial shade and dry conditions. Suitable for coastal gardens. Stems are quite strong, but staking may be required in windy locations. Cut back to near ground level after flowering. Leave the flowering stems on the plant if you wish to encourage self-seeding. Cutting spent flowering stems back early in the season helps the plant to produce a second flush of flowers. Divide the plant after 3-4 years. Echinops ritro is generally trouble-free and easy to grow. Attractive contrasting plant with globe-shaped flowers in stunning metallic blue, set off beautifully against the silvery stems and greyish foliage. Combines well with tall grasses that flower at about the same time, such as Miscanthus sinensis cultivars. Excellent for dried and fresh cut flower arrangements. Evergreen bushy shrub in the daisy family, native to South Africa. Finely divided grey-green, downy foliage. Silvery grey buds on white, downy stems, open to yellow daisies, to 6 cm across. Flowers virtually all year round in warmer climates. Very versatile, unfussy plant. Prefers a position in full sun and well-draining soil, but tolerates a wide range of conditions, including drought and coastal exposure. Hardy to -120C. Prune to maintain size and shape. Great for winter colour. Mainly grown for its attractive flowers, but also useful as a beautiful grey green foliage plant that can be trimmed to a compact ball or bun shape or used as a hedge. Evergreen mound-forming perennial to 60 cm tall and wide. Large, 15-25 cm wide, glossy dark green, rounded, undulating leaves with yellow spots. Yellow daisy-like flowers in clusters during autumn, rising above the foliage. Synonyms: Farfugium japonicum 'Aureo-maculata', Ligularia tussilaginea 'Aureomaculata'. Best in a partially shaded position where it receives some morning sunlight, but also grows well in deep shade. Clump forming plant with large, leathery, glossy leaves on long stalks. Often referred to as tractor seat plant in New Zealand because the leaves have the same shape and nearly the same size as the metal seats of vintage tractors. Long flowering stems with panicles of yellow daisy-like flowers during late summer or autumn. All parts are poisonous. Hardy to -18oC. Tolerates drier conditions than many other Ligularia species, but even with adequate moisture leaves may wilt if the position is too sunny. Synonyms: Ligularia reniformis, Ligularia tussilaginea, Farfugium japonicum var. giganteum, Farfugium reniforme. Evergreen perennial with large heart- or kidney-shaped leaves, deeply veined, 15 to 30 cm wide. Large heads, 10 to 15 cm wide, of sky blue flowers with white centers in spring. Native to the Chatham Islands. Ideal for shady areas. Tolerates full sun as long as the root system is kept cool. Requires fertile, well-draining soil. Susceptible to fungal diseases, in particular in moist sites. Needs protection from slugs and snails. Hardy to -12oC. Combine wiith fine-leafed plants, such as ferns and grasses. Flax of hybrid origin, developed in New Zealand and protected by NZ Plant Variety Rights. The arching leaves are evergreen, chocolate brown, edged with bright olive green, and usually with a lighter midrib. They are 3-5 cm wide and up to 1 m long. Flowers attract nectar-feeding birds. Prefers a sunny or partially shaded position in relatively dry, free-draining soil. In humid areas, select an exposed site to reduce the incidence of foliar diseases. Tolerates wind, coastal conditions, and medium frosts. Tidy up once a year by removing old leaves at the base. Primarily grown as a foliage plant for its colour and shape. From a distance the overall appearance is dark greenish-brown. Looks great when planted in groups or even as a single plant in smaller areas where the gorgeous brown with green colour combination of the foliage can be appreciated. Suitable for containers. Great contrast plant when surrounded by finer-leaved species. A tough little flax with narrow, olive green leaves and reddish-brown leaf margins. Usually, some of the leaves have an obviously twisted section. Its little brother Phormium 'Surfer Bronze' has chocolate-bronze foliage. Phormium 'Surfer' may produce long spikes with orange-bronze flowers in late spring. Phormium 'Surfer' is very easy to grow in a sunny or partially shaded position in well-draining soil. It can handle drought once established, and also copes well in windy locations. Frost hardy to about minus 12 deg Celsius (zones 8-11). Suitable for coastal gardens. Nearly daily I walk past a garden where groups of Phormium 'Surfer' have been planted in the shade of large trees. They look awesome even though they don't appear to grow any taller. The ones in the photographs are planted in full sun, and after one year they are fuller and bigger than the plants in deep shade. Phormium 'Surfer' looks great in groups, especially when combined with grasses and groundcovers such as Coprosma acerosa. I also love the beautiful colour combination of the bronze-purple foliage of Loropetalum 'Burgundy' and the bronze-edged leaves of Phormium 'Surfer'. Evergreen cultivar of the New Zealand native Pittosporum tenuifolium (kohuhu), forming a compact shrub with small light green oval leaves 2-3 cm long. Tiny black or purplish black flowers of about .6 cm across. Prefers a sunny or semi-shaded position and well-draining soil. Moderately fast growing under average garden conditions. Growth rate is reduced in shade. Avoid wet sites. Responds well to trimming. Tolerates moderate frosts. Lovely fresh green foliage plant. Tends to grow into a rounded shrub by itself, and with a little help it can be maintained as a perfect ball-shaped plant. A great alternative to the much slower-growing Buxus sempervirens. 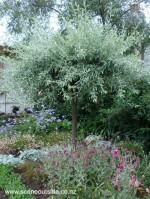 Graceful small tree with a rounded canopy, silvery grey willow-like foliage and pendulous branches. Creamy white flowers, to 2 cm across, in spring, some of which are followed by small pear-like, inedible fruit in autumn. Brief period of yellow autumn foliage. 'Salix' is the Latin word for 'willow'. Prefers a position in full sun or partial shade in well-drained soil. Adaptable to a range of soil conditions. Suitable for coastal planting. Prune in late autumn to keep the canopy compact. Remove branches below the canopy to make sure the rootstock is not going to overtake, and to keep a 'clean' stem.